Several businesses and restaurants are celebrating Leap Day with sweet deals this Monday. 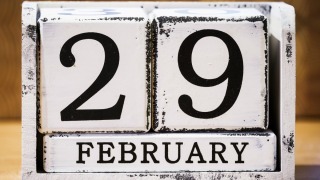 Leap Day only comes once every four years, so why not celebrate? Whether you're marking a rare birthday or just want to do something special for the extra day, check out these travel, retail and meal deals and freebies in and around D.C. this Monday. The Embassy Row Hotel is having a sale Feb. 29. Book a two-night stay for a future date and get a third night free (or a sixth and seventh night free if you book five nights). The deal also includes a $50 food and drink credit to spend at Station Kitchen & Cocktails or The Rooftop. Take 15 percent off any purchase of $70 or more at Foot Locker through Feb. 29. Use the code "LKS16F3L" at checkout. Many of the Greene Turtle's locations are celebrating Leap Day with 29-cent bone-in or boneless wings all day from open to close. However, the Verizon Center and Baltimore/Washington International Thurgood Marshall Airport locations are not included. On Feb. 29, save 29 percent when you book select hotels worldwide through the Expedia app. On Feb. 29 only, if you buy any dozen Krispy Kreme doughnuts, you can get a second dozen of original glazed doughnuts for only $2.29 at most locations. Legal Sea Foods is offering two one-pound steamed lobsters and a choice of two sides for $29. For the other 365 days of the year, lobsters are served individually for $25.95. The one-day promotion will be available at all area locations, excluding Reagan National Airport. Treat yourself with a steak dinner. On Monday, Morton's Steakhouse is offering a "Make Your Leap Day Count" two-course meal (an appetizer and an entree) for $29. Choose from dishes including the six-ounce filet served with sour cream mashed potatoes and the honey-chili glazed salmon fillet with vegetable relish. Add a bottle of Pebble Lane wine for $19. The fast-casual pasta chain announced its opportunity for customers to "Leap the Line" when placing an online order on Monday. Guests who order online will save $4 off any $10 purchase by entering the code LEAPTHELINE at checkout. Get a six-ounce filet and an Oceanaire jumbo lump crabcake for just $29 at the Oceanaire Seafood Room in D.C. at Penn Quarter (1201 F St. NW). Travelocity will give discounts of up to 30 percent on hotels until Feb. 29. Save 29% when you book select hotels worldwide through the Expedia mobile app on Feb. 29. Currently, Urban Outfitters is having an entire sale in stores and online featuring items that are $29 or less. Shop for women's or men's apparel or for decorations for your home. The sale ends Monday. You can join Zipcar for just $29 on Leap Day, a 70-percent savings. Go here and use code 29LEAP2016. Family-style Italian restaurant Buca di Beppo is treating those with Leap Day birthdays to its signature meatballs and spaghetti dish Friday through Monday. Leaplings just need to show an ID proving that it's their birthday to receive the celebratory dish. Del Frisco's Grille in downtown D.C. (1201 Pennsylvania Ave. NW) is celebrating Leap Day birthdays with a free order of cheesesteak egg rolls. Get an entree on-the-house at Hard Rock Cafe this Monday if it's your birthday. Select a plate of Hard Rock's "Leaplings Eat Free" menu. Dishes include the Legendary Burger and the Honey Mustard Grilled Chicken Sandwich. Take advantage of the "Forever Young" package offered by the Melrose Georgetown Hotel. Leaplings who stay at the hotel on their birthday will receive overnight accommodations and a dinner for two, complete with birthday cake and a champagne toast at the hotel's farm-to-fork Jardenea Restaurant. Packages start at $229. At participating Pizza Hut locations, the Leap Day-born can enjoy a free, one-topping Personal Pan Pizza for carryout this Monday. Just bring a government-issued ID. Anyone born on Leap Day can receive a free slice of pizza at participating Villa Italian Kitchen locations. Leap Day babies must present a valid ID to get the deal.